Best Badminton Rackets in 2019: Which One is Right for You? Before every game, Roger Federer spends around 4 hours restringing each of his rackets (he has 10). This shows the amount of importance he places on the quality of his racket. Your racket can help give you that extra edge you need to beat your opponent. It should feel like an extension of your arm. This also means there is no “best racket.” Each player is different, and the perfect racket should be tailored specifically to their playstyle and experience. Many people write off the Arcsaber 11 because of its age. But there is a reason it was used by many athletes in the 2018 All England Open. It can still compete with some of the best rackets in the world. The Arcsaber features an extremely stiff shaft, which allows for a higher degree of precision and control. However, more rigid shafts also require better technique. This is why we recommend beginners to stay away from this racket. It also features the traditional Isometric design that has become quite popular amongst Yonex rackets and is exceptionally balanced. This makes it perfect for those who love playing fast rallies. In fact, the nimbleness of this racket lets you beat your opponents on pace alone. A major concern, we’ve had with this rackets is that its recommend string tension is between 19-24 pounds. Most advanced players know that this amount of tension does not give you the precision you need at a professional level. Now we’re not saying that high tension is always better, but it is possibly the only reason we may pick another racket instead. Most 3U weight rackets are usually suited for doubles matchup. However, the Archsabers defense and balance make it a fantastic choice for both formats. This is very rare to see in most high-end rackets which are specifically designed to suit one format or another. If you frequently play both singles and doubles and are looking for one go-to racket, then the Archsaber has to be your only choice. Most high-end Yonex rackets spare no expense on the materials used. The Arcsaber is no different. The shaft and the frame feature a lot of H.M graphite(High Modulus Graphite). The extra strength of H.M graphite makes your racket much more durable. You can read more about how H.M graphite and other materials affect the quality of your racket in the before you buy section. The frame of the arch saber uses a unique combination of H.M graphite, sonic metal, and nanotubes. This sonic metal core removes the excess vibrations created when the shuttle comes into contact with the racket. The frame is designed to get rid of any interference from vibrations, leaving you with a precise and very very accurate shot. This way when you hit the shuttle, you know where it is going. Most racquet sports players know that the longer the ball/shuttle stays in contact with the racket, the more control they have. This is why manufacturers are spending millions in R&D on optimizing the contact time between the racket and shuttle. The frame of the Arcsaber 11 uses neo-CS carbon and normal CS carbon on its sides. These materials help the frame flex on impact, causing the strings to flex as well. The string flex means that when the shuttle makes contact with the racket, it is held in place on the string bed for a microsecond longer. This allows you a lot more control and finesse on your shot. Just like the frame, the shaft of the Arcsaber uses H.M Graphite and Ultra PEF. The Ultra PEF(Poly Ethylene Fibre) is supposed to be light enough to float on water but extremely durable at the same time. This allows for maximum shock absorption allowing you to play for longer without getting exhausted. Most Arcsaber players are likely to change the strings once they get their racket but the factory strings provided are surprisingly great. They have a pretty high tension(which might scare someone who’s never used a high-end racket like the Arcsaber before), but they are pretty durable. The racket also uses the new grommet pattern which helps keep the string tension for longer. 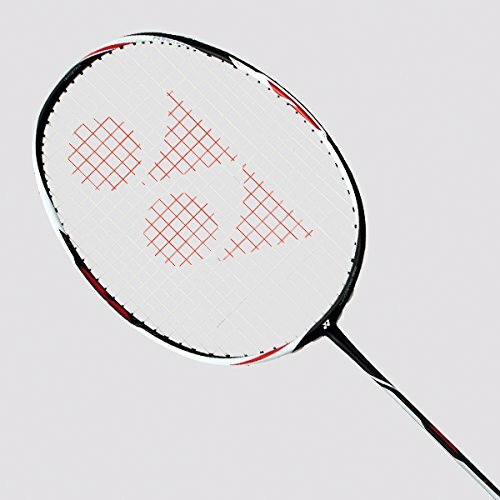 The Arcsbaer uses Yonex’s latest T-Joint technology which has been proven to help the stability of the racket. The new T-joint design also reduces the torque on the racket. The maximum recommended stringing tension for the Arcsaber is 24 pounds which can be an issue for advanced players. 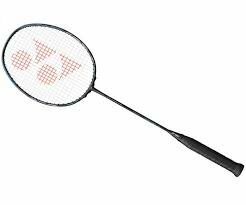 Yonex Duora Z Strike Badminton Racquet - Strung with Nanogy 99 (26 lbs), World Champion Viktor Axelsen's Racquet! The number 4 player in the world (as I was writing this article), Victor Axelsen uses the Duora Z-strike and for good reason. It is a very very good racket. It is perfect for those players who like a head heavy racket but find the Voltric a bit too much. The Duora Z-strike feels like a cross between the powerful Voltric Z Force II and the nimble Duora 10. While the power in the Z Force II felt a bit like wrecking ball, this felt a lot more… focused; kinda like a whip. This could be attributed to the super thin shaft. It makes the racket bend just a bit on smashes. When you begin to use this racket, this whip-like effect can feel a bit weird, but once you get used to it, smashes with this racket are absolutely amazing. The recommended string tension for the 3U version of this racket is around 20-28 lbs which pretty great for even professional tournaments. The Duora Z strike takes a lot of the style inspiration from its predecessor the Duora 10. This means it has the iconic Duora style design with either side of the racket having different colors. But this time around you get a matt finish. Matt finish is a lot more resistant to chipping than glossy finish rackets, which is great if you are looking for a racket that will look great even after a lot of use. The frame for the Z-strike uses HM graphite instead of regular graphite. This helps increase the overall durability of the racket. Additionally, the frame also contains Nanometric DR and Hyper-MG.
Just like in the Duora 10, the Duora Z-strike uses a dual optimum frame albeit improved. This means it has two frames technologies on either side of the frame: one for backhand shots and the other for forehand shots. The backhand side has an increased repulsion(~9%). This helps increase a lot as you are defending your opponents smashes. Just like in the frame, the shaft of the Duora Z-strike contains HM Graphite, Nanometric DR and EX HMG. The shaft is extremely thin and stiff. Yonex claims that this helps with aerodynamics and making it easy to swing around. The shaft also tends to bend just a bit on smashes, giving the racket a semi-whip like feeling on when you swing it fast. This racket takes some time getting used to as the two sides react very differently from each other. The Duora Z-Strike has a tremendous amount of speed and power making it a perfect pair for any aggressive player. If you like to play aggressively, you can dominate your opponent with this racket. 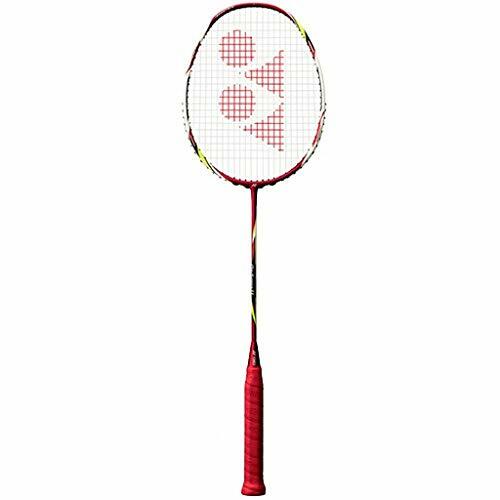 We personally prefer this racket over the duora 10 because even though the duora is pretty powerful, it cannot compete with the Z-strike. The Astrox 99 is the latest creation by Yonex, launching just last month. Being its newest flagship racket, the Astrox 99 is crammed with almost every cutting edge tech Yonex could get their hands on. But the racket is made particularly for players who prefer precision and placement over strength. Compared to its predecessors the 99 has adopted a full frame NAMD( discussed below), allowing greater placement and shot precision than anything the world has ever seen. Like many of the other high-end advanced rackets, the Astrox 99 uses a stiff shaft. Another thing you might notice about the shaft is its length. The Astrox 99 features a very slim long shaft, which is longer than your typical racket. This added length provides a bit more leverage as you swing your shot giving you that much more power. The slim length also helps the racket aerodynamically allowing the Astrox to slice through the air with grace. Currently, this racket is available in two version 3U and 4U. However, if you prefer a faster racket you should go for the 4U version as 3U is a bit heavier. The recommended string tension for 3U is between 21 to 29 pounds which fantastic even for professional tournaments. Despite the new innovations, the main selling point of the Astrox series has always been its rotational generator system. 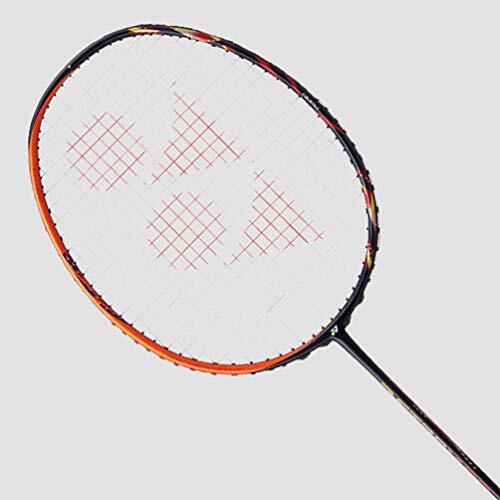 It gives this racket a head heavy feel when you are taking a shot while feeling extremely light and balanced as you are moving. We have explained the working of the rotational generator system in detail in the FAQ’s, so be sure to check that out. The 99 is the first variant of the Astrox product line to feature a full frame NAMD. It is a technology Yonex has been putting into their rackets for some time now. However, before the Astrox 99, the use of NAMD was only limited to the shaft of the racket. Lab testing has shown that NAMD doubles the contact time of the racket with the shuttle. But if that was not enough, the frame regains also its original position faster than any racket in the world. The frame of the Astrox is made from H.M Graphite, NAMD, tungsten and nanometric tubes. Nanometrix tubes are inserted into the frame of the racket to help increase the repulsion power, toughness and impact strength. It also uses the Aero box frame technology. This combines a sharper, faster frame with a blunter and more powerful frame into a single solid frame. Allowing your racket to be quick and powerful at the same time. The Aero box design is a slight variation from the dual frame technology used in the Duora series. Just like the Arcsaber, you get to use yonex’s latest T-Joint technology to provide stability for the racket. The T-joints also minimizes the torque on your rackets as you swing it throughout the game. The shaft of the racket is made from High Modulus Graphite and NAMD. How does a Full-Frame NAMD Feel? When we first heard about new Astrox using a full-frame NAMD, we were pretty skeptical. NAMD helps the shuttle hold on to the racket for longer. We were unsure about how this would work and expected that extending the NAMD to the entire frame would cause some loss in control. However, that is not true. It actually quite the opposite. Since the racket was just launched, we haven’t seen it being used in any major tournament. However, as most badminton fans know Lee Chong Wei and Kento Momota are the main ambassadors for this racket. This is an advanced racket best suited for singles oriented players who love to play with control. The Duora 10 is an odd piece. It was launched almost 2 years ago and since then it has aged pretty well. Over the years, more powerful and faster rackets have launched. But somehow the duora 10 has always stuck around as one of the top rackets. 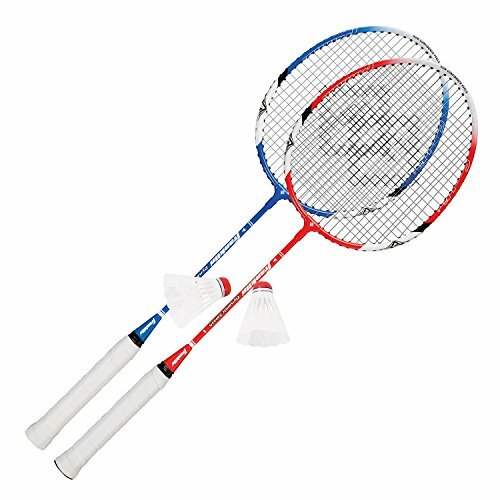 In fact, the best player in the world, Lee Chong Wei actually used this racket for the last 2 years before switching to the Astrox 99. Even today it is still a favorite amongst many players and has quite the fan following. Because of this popularity, Yonex has made this racket available in tons of different colorways. The black-orange-blue variant is our favorite and is also the colorway used by Lee Chong Wei. Being a reasonably balanced racket, the duora 10 is perfect for doubles matchups. It also has one of the best defenses out of all the rackets on this list. Many materials used in the duora 10 have aged pretty well. In most cases, these material have been improved upon in the current generation of rackets but that’s not a knock against the quality of the Duora 10. It is still an amazing racket. The Duora 10 is also one of the first rackets to feature the dual optimum system which we’ve discussed earlier(in the duora Z-strike review). Although the frame is better utilized in the Z-strike it is still pretty impressive in the Duora 10 as well. The shaft for the duora 10 is made from H.M graphite and Nanometric. Playing defensive shots becomes effortless, there’s a good chance that you will start defending shots you could never before. The strings that come with this rackets aren’t too great and you might consider replacing them. Overall the Duora 10 is not the most powerful or the fastest but it is still one of the best rackets overall. This racket is perfect for doubles matchups or players who love counterattacking opponents shots. Another oldie on this list is the Voltric Z-force II. This racket was first launched in 2015 and ever since then, it has been considered one of the top rackets in the world. Nothing changes this year either. The voltric Z-Force is pretty head heavy which means you can hit absolutely powerful shots with ease. Combined with its stiff shaft(detailed below) you have a racket that has the potential to dominate every kind of opponent. However all this offensive power comes at the price, the racket is kinda head heavy, this means the defense can feel a bit sluggish at times. Although it’s actually lighter than the duora 10, you would not believe it when you compare the rackets in your hand. This is because of the duora 10 is a balanced racket while this Voltric is head heavy. Voltric Z-force also has an absolutely gorgeous design. It has become one of the most iconic designs in badminton rackets. So much so that it already has many low-end imitations. When it launched, Yonex advertized this racket as having the thinnest shaft ever. While this is no longer the case, it is still a pretty aerodynamically powerful racket. The frame is made from HM Graphite and Nanometric tubes just like all other high-end rackets by Yonex. Many rackets ensure that their shaft can bend a bit on smashes and other powerful shots. The Z-force II takes the opposite approach. It provides an extremely stiff shaft that will not bend even a bit. Yonex claims that while this whip-like effect is fantastic in adding more power to your shots but you also give up some control. By providing an extremely stiff shaft, the Z-force II can maintain is extreme control. So every shot goes exactly where you want it to go. Shots go exactly where you want and how fast you want them to go. It has a very huge sweet spot so even if you hit the edge, you still get a lot of power on your shots. If you are just getting started with badminton then you don’t need to spend a ton of money on a new racket. The Franklin sports racket is a great beginner racket to start with. Most beginner rackets tend to be really light. While this may sound like a good thing, it actually means you need to put more effort in your shot which can hinder your technique. The gripping on this racket leaves a lot to be desired. Many users have complained about the grip getting slippery from the sweat. Picking a racket is a very personal choice. You want to go for something that suits your playstyle and where you currently are in terms of experience and skill. You don’t to make a choice based on what others say i or what your favorite player uses. What works great for someone may be a horrible choice for you. Following are some of the main criteria to look at as you are picking a racket. The balance of a racket is measured in “mm”, it describes the distance between the bottom and the balance point of the racket. Players who like playing a powerful brand of badminton absolutely love head heavy rackets. Hitting shots deep becomes effortless. If you like fast smashes and annihilating your opponents with pure destructive power then go for a head heavy racket. However this power comes at a cost, head heavy rackets tend to put a lot more strain on your arm. The biggest problem with using head heavy rackets is that you tend to put a lot of strain on your arms. This becomes a bigger issue if you are not strong enough and may even lead to injuries. Head light rackets provide a much faster reaction time(as the racket balances itself much faster) however you sacrifice some strength for this added quickness. Head light rackets are a great choice for a player who likes to play with control and finesse. As your skills level increases, you should also increase the string tension. This is because at higher string tensions you get much more power and control however you also have a really small sweet spot while lower tension offers a much larger sweet spot but at the cost of control and power. The string bed is much harder here and you begin to get a slight feeling of the shuttle allowing you better control of your shots. You also need to be careful about where the shuttle hits the rackets as the sweet spot is no longer covering the entire string bed. Also if you like to play with plastic shuttles, it is recommended to lower your string tension by 1-2 lbs. This is because plastic shuttles are heavier and fly differently than feather shuttles. You also need a lot more power to hit a plastic shuttle the same distance as a feather one. You might be tempted to buy the most expensive or the best racket in the world. Not only is this a bad idea, but it will also ruin your game. You see, the pricer high-end rackets are specially designed for players who know their craft. This means they have smaller sweet spots and require a lot of skill to control. If a beginner were to play with an Archsaber 11, they would not be able to return most shots. Many coaches recommend parents with younger kids to get them extra light rackets. Their reasoning? Small kids are weaker and playing with a light racket is an easy way to counter their weakness. Firstly, heavier rackets may be tougher to carry around but they also need less energy to use. This is because as you swing your racket, its momentum builds up much faster. When the shuttle comes into contact with the racket this energy is transferred to the shuttle, resulting in powerful returns. However, if you are playing with a lighter racket, you would have to exert a lot more energy to generate the same amount of momentum. This is why we recommend beginners to start off with heavier rackets. Secondly, you want your kids to get better at badminton. So instead of lowering the weight of the racket to adjust your kids, provide them with heavier rackets so they grow stronger. Although most new rackets use the New Grommet Pattern, we felt like it was necessary to help you understand exactly what’s going on and why it’s good for you. For those who don’t know, a grommet is that piece of plastic that holds the string to the frame. About 5 years ago, Yonex decided to change the grommet pattern for all their rackets.This newer design allows the strings to retain their tension for much longer without having to be constantly restrung. Whenever possible try to look for a racket with the newer grommet design. If it’s not specified it’s safe to assume that it does. A racket is not just a chunk of metal anymore. You’d be surprised at the amount of R&D that goes into the development of each new racket. Innovation has kept Yonex as one of the leaders in the industry. Many of these metals aim to maximize the skills of the racket. But the sheer number of them can get a bit confusing. We have aimed to provide a detailed explanation for all of Yonex’s tech and how it would affect your game. Sonic metal is a special kind of alloy used to control any excessive vibrations produced when the shuttle hits the racket. This reduces external interference and lets you fire your shot with laser sharp precision. Sonic metal also creates an awesome booming sound on smashes. It the same kind you see on TV. You cannot recreate this sound on a low-end racket. The Joint is the part of the racket where the frame meets the shaft(aka where the round thingy meets the stick part). Additionally, there is a T-anchor embedded into the shaft to reduce any excess torque. So even if you hit the shuttle a bit off center, you can get a pretty powerful shot. Badminton rackets need to be strong enough to withstand the tremendous force exerted during games but at the same time they need to be light enough to be swung around all game long.That’s exactly what Yonex hopes to achieve with Ultra-PEF. It is touted as being lighter than water but yet strong enough to handle even the most powerful smashes. The archsaber line is just one of the many high-end product lines by Yonex that uses Ultra-PEF. This material is embedded into the shaft of the racket. It helps maximize the shock absorption so that there is less stress on your b ody. NAMD is the biggest selling point for the astrox line. However, it has been used in badminton rackets for almost 10 years now. NAMD helps give you a lot more power in your racket. But while the power in the Duora Z strike feels really destructive, the NAMD power feels a lot more controlled. NAMD is usually limited to the shaft of the racket. However, Yonex’s latest racket comes with a NAMD frame. This helps double the contact time with the shuttle as compared to a non NAMD racket. The frame also regains it’s original position much quicker. NEO-Cs carbon is much stronger(~20%) and slightly more durable than normal CS, however, the two measure equally in stiffness. Neo CS carbon also absorbs the shock slightly better than regular cs carbon. Why not build a racket with just neo-CS carbon? After reading about neo-CS carbon in the previous question, it might seem like making a racket from only neo-CS carbon is always the right choice. However, a racket is not just a chunk of metal. The guys at Yonex also have to focus on optimizing the aerodynamics of the racket while keeping it cost effective. However, for singles matches which are a lot more slower, the positioning of your shots matters a lot more. Why are high-end rackets cheaper in Japan? All high-end Yonex rackets are actually made in Japan and this is why you won’t have to pay any import tax when you purchase it there. Similarly, all other Yonex rackets are manufactured in Taiwan and China. So if you or anyone you know if going to Japan, it is your best chance to get a good racket for cheap. What is the Isometric Design? Some shots just sound great. They also tend to go exactly where you want and with great power. Overall they “feel good”. This is called the sweet spot. Your shuttle has the maximum return power when it hits the sweet spot of your racket. Naturally, you want to design rackets to have larger sweet spots. This led to Yonex coming up with their now patented Isometric design. The isometric design makes the rackets look kinda boxy and helps maximize their sweet spot. In fact, this design is one of the main reasons you see the top athletes stick to Yonex rackets and has made Yonex the global leader in badminton rackets. The rotational generator system is one of the unique features of the Astrox series. It helps the racket achieve a head heavy feel on swings. So your shots much more powerful without the disadvantages that come with a typical head heavy racket. The weight at the bottom acts as a counterweight to the ones at the top. So when you are moving laterally or defending, the weight at the bottom and head cancel out each other making the racket act like a balanced one. However, when you swing the racket to take a shot, you will still get the head heavy feeling and power that comes with it. We understand if you are a bit reluctant to spend over $200+ on a good badminton racket. But think of picking a racket as a long-term investment. If you find a racket that suits your playstyle you can use it for a really long time without any issues. So don’t let your racket hold you back. Want other outdoor game review? Read our backyard games ideas here.